It’s important to know how your content is performing, so that you know how to improve it. 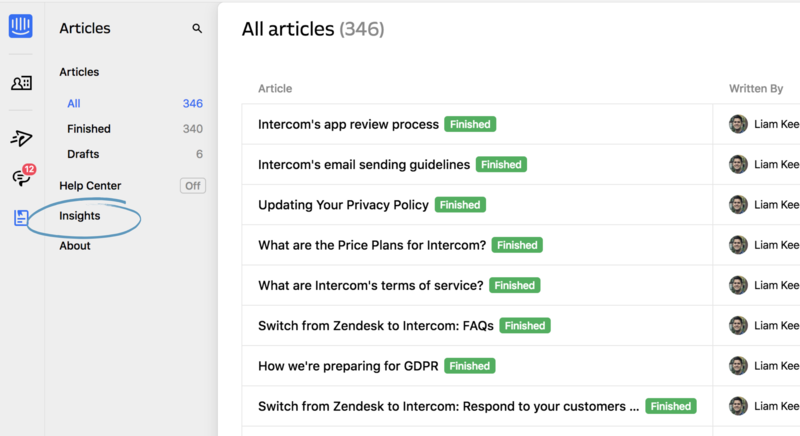 On your Articles Insights page, you’ll quickly see which articles to write next, what’s popular and most importantly, what needs to be fixed. To view your Articles Insights, click the Articles icon on the left-hand side of your screen and select ‘Insights’ from the top bar. Then toggle the date range at the top to see how your content has performed in the past week, month or quarter. The ‘Write new articles’ section of your Insights shows you which terms customers searched for most, but didn’t find. You should write an article for each topic customers would find useful. Scroll down and you’ll see the ‘Review these articles’ section - this shows you which articles pulled in the most viewers, conversations and negative reactions. Simply select whichever heading you’d like to view the results for. Pro tip: Here’s how to improve articles that get negative reactions based on rich customer data. Note: You’ll also see the date each article was last updated in the left-hand column. If an article hasn’t been updated in quite some time, review it to ensure the content is still accurate and relevant. How are negative reactions calculated? The ‘Reactions’ tab shows the percentage of people who reacted negatively to an article compared to the total number of people who reacted to it. For example, if 150 people reacted to an article and 22 of those were negative reactions, the ‘Reactions’ tab will show 15%. You can quickly see how many articles Operator has successfully resolved for customers. To improve your smart suggestions, make sure your content is relevant and includes words your customers are likely to use. How often do my Articles Insights update? Your Articles Insights get updated once a day (midnight for your timezone). Give your customers the content they’re searching for. Use conversation data to improve articles. See what content works best (and write more of it). Make sure your content is discoverable. Now that you know how your Insights work, go ahead and check out the terms your customers are searching for - you’ll find inspiration for your next article.